It’s kinda funny when you (or others) say “I couldn’t do what you do” referring to my improv work. Five years ago NEITHER COULD I! 😉 I was a very traditional quilter – like what else WAS there? But just trying things like cutting fabric up to see where it takes me – that’s all I do. I've gone back in time to show you a bit about my improvisational progression. In other words, to prove to you that you've gotta start somewhere! 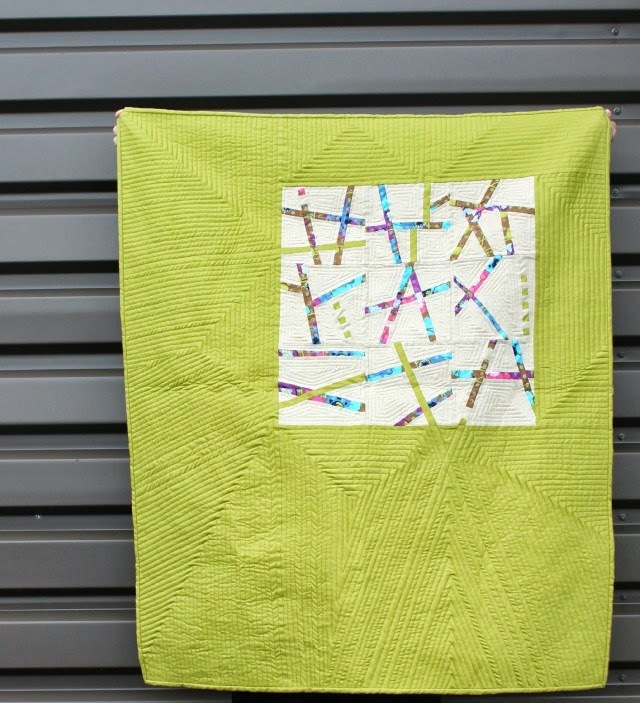 Here's one of the first improv pieces I could find.... a little quilt from 2012. Improv lines are a fantastic way to start - letting your eye and your rotary cutter direct you as you go. A wonky cross, also from 2012, and another terrific way to start. 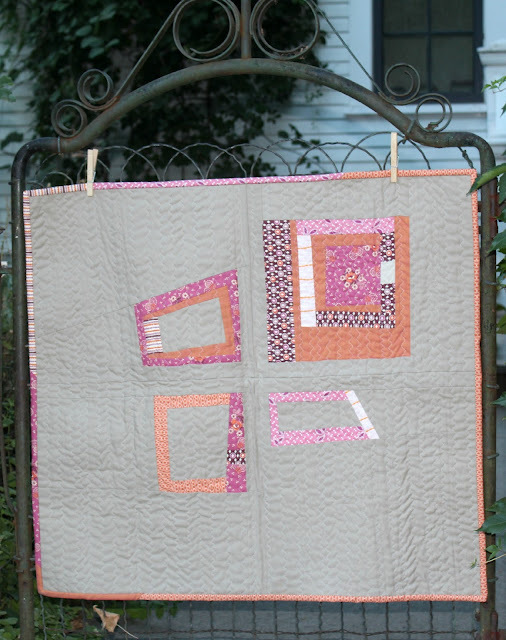 It was also in 2012 that I took a class with Katie Pedersen, where we explored every technique in her and Jacquie Gering's book, Quilting Modern. 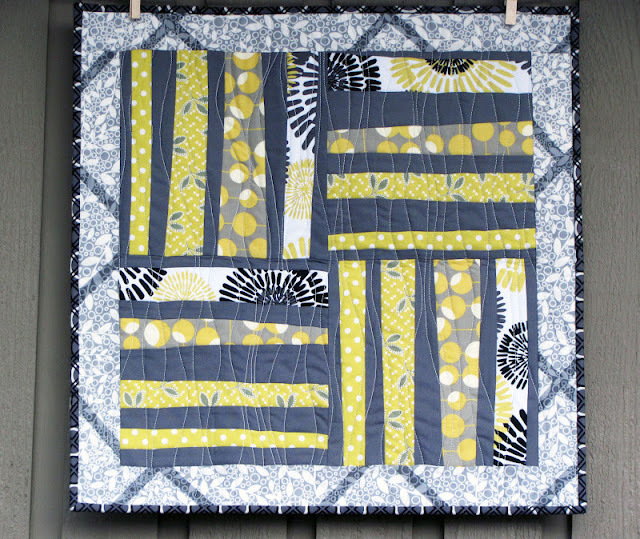 The result of that class was this two-sided quilt that hangs over my studio desk as a reminder to try new things. The techniques, even guided by Katie and her book, felt foreign, and it would be another year before I attempted improv again. This time, in another class with both Katie and Jacquie, we explored the cut-and-insert method further. It's still a pretty controlled style of improv. and the outcome was Fissures. 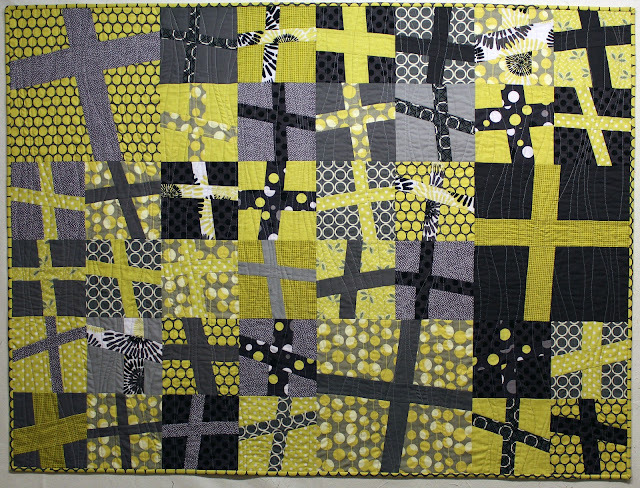 which coincidentally went on to win 2nd place in the modern wall quilt category the 2014 AQS. Talk about affirmation. 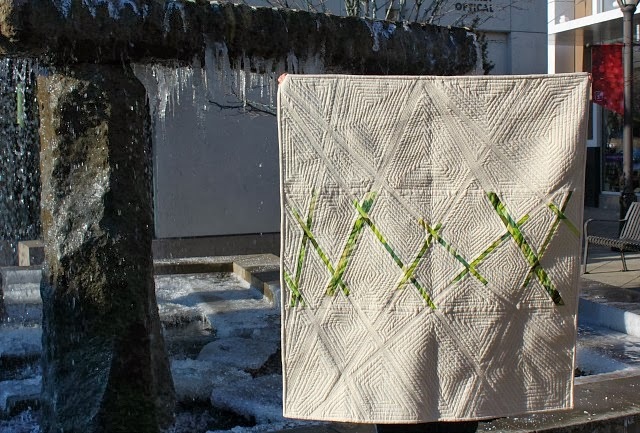 I began to dabble a little more on my own, and in Unknown Journey, I incorporated scraps, an uncertain path, and carried the design into the quilting. Note that at this point in time, I was still using a ruler to guide me. Making Red Hots in 2014 was the first time I used improv curves, and it was earth-shattering. And so it went.... occasionally you'd see me come up with an improv quilt design. Just as often, not so much. There is no doubt that joining Bee Sewcial in January 2015 was a turning point. I saw other makers doing things I'd never seen and certainly never considered. A door that had been opened a crack opened much wider. In most of my own quilts, the improv I do is relatively simple. 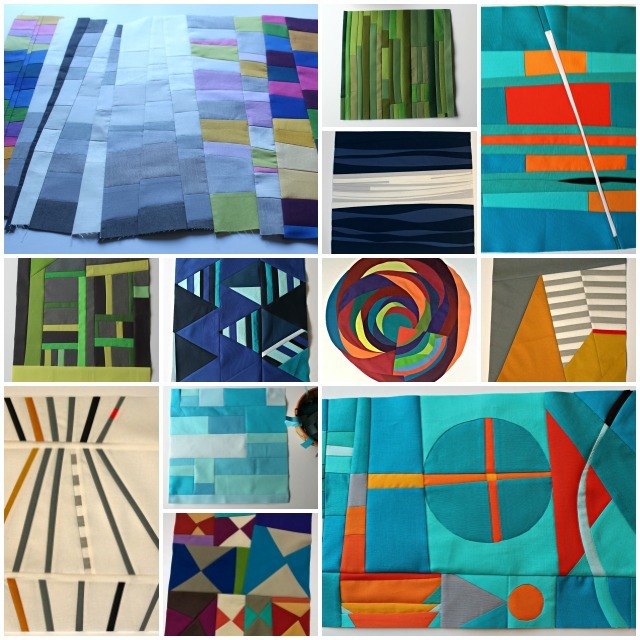 But with my Bee Sewcial blocks, inspired this year by the themes "linear", "stretch", 'layers", "triangles", "direction", "lake country", "transition", "self love", and "circles", oh my, it's been a different story. I've tried new things again and again, most often just walking up to my cutting table with rotary cutter and a stack of solids and getting to it. That's the crux of improv for me - the exploration of it all. If it's not you, fine. Do what you love. But if you are curious but just intimidated, I encourage you to test the waters. Just start - anywhere - and give it a try. WOW! I have tried a bit of improv, and like you I consider myself traditional. But improv is truly a bit of fun and a different path to wander down. Yours are AMAZING! Thank you so much for sharing your improv progression! I get those comments a lot, too, but like most things, you just need to start! This is such a great topic for a blog post. I think I just might be inspired to write about my improv path some day, too. Marla, I'd love to read about that, too! In the new year, I have plans to do a few improv tutorials for beginners. Maybe a post about my progression would be a good way to kick it off.thanks for the encouragement, Daniela. Thank you for sharing this. It is encouraging and reminds me that some of those rock star quilters out there actually had a starting point that they had to jump off from. I tend to forget that you didn't start out just knowing all of this intuitively, but had to work your way there. Thanks! So interesting to see your progression, and inspiring too. What fun to see your progression. Thanks for sharing! Each one of these works are beautiful. Fissures and Turning Point really appeal to me a lot. This post serves as a reminder of how far a person can get with a bit of courage to explore and the drive to follow through. The progression alone is fantastic to see, but I love your message and way you honestly describe your journey in a way to encourage others to try. Really interesting blog post Debbie ! It's nice to see the progression of your improv' work. Thanks for sharing. Now I want to try improv. 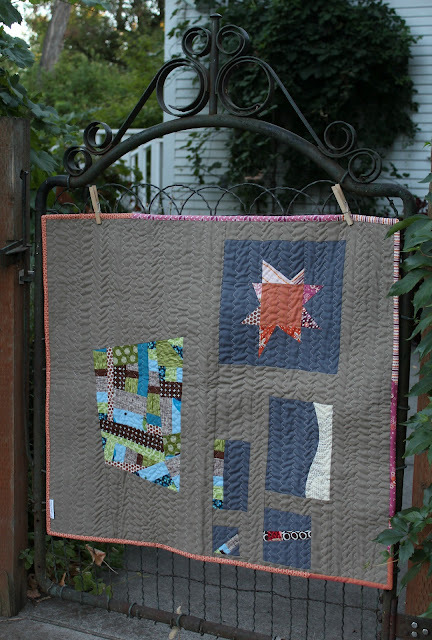 Years ago, I played with small projects and quilting. I have one 6" x 9" piece that I still have hanging around, unfinished. Lately, I've been looking at it thinking I should bind it and actually hang it to remind me of what I used to do; but lost over time and all the life changes I have had. Maybe it's time for me to go back to basics. Thank you for showing your beginnings, that may just be the gentle shove I needed. Thank you so much for sharing your improv journey, it's good to know that everybody starts somewhere. I am officially jealous of the course you did with both Katie and Jacquie, their book was one of the first I bought, just tried out crazy piecing. There's so much more to explore though. That's on my to-do-list for 2017: explore! I love hearing about your journey and it has made me think about my own. I am inspired by you, and many others. Can feel myself stretching more & more in the improv area. Can't wait to see where this all leads you next! I really love seeing your journey! Mine is fairly similar. :) I started out thinking "I'm not an improv quilter and don't think I ever could be" and then I did a few dabbles and then I joined beesewcial and now that's all I ever want to do now. Haha! Thanks so much for sharing, Debbie! I'm an improv quilter all the way, patterns don't cut it for me. No pun intended. I have a friend who has been a trad. 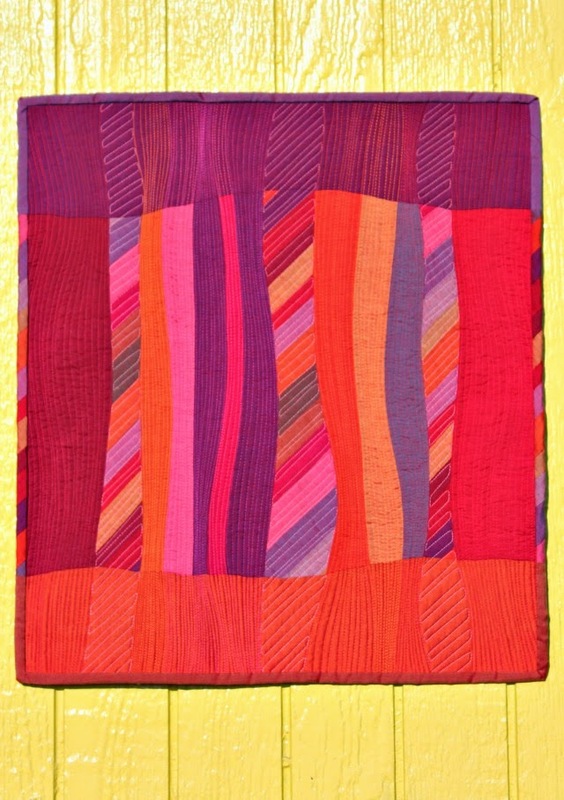 quilter for a long time and feels a bit hesitant but wanting to start doing improv. Sending her link to this post right now! TFS! Wow! That is a great story and your pictures illustrate your preogression beautifully! I love, love the improv work (your latest circular improv....WHAT?!) but the linear thinking accountant in me needs to build up the nerve! Starting with straight lines though is a great idea! Amazing progression! I think we all should do what we love and not everyone has the mindset for traditional or improv. Me...traditional always stumps me! Very interesting to see your progress. Your work is great! Thanks for sharing this progression. I love what you've done. The Red Hots is wonderful!! I was lucky enough to have a one day workshop with Jacquie and it would blow my mind to have Jacquie AND Katie at the same time. I read Katie's blog all the time and always wish we could get her on the east coast for awhile. Thank you for sharing some of your early improv work. Improv can be intimidating, but you have shown some really get beginner projects. I've enjoyed watching your journey! I LUV LUV LUV ALL UR QUILTS!!! AM A BIG FAN OF YOUR WORK UR BLOG AND UR FLICKR STREAM!! !